The fabulous animator, director (and Bloomsbury author ;) Barry Purves will be at this year’s Romics International Festival to collect a Romics d’Oro lifetime achievements award. What is there to say about Barry that has not been said already? His work has seen him nominated for Oscars and BAFTAs, has won over sixty major international awards, worked in film, theatre, advertising, and still found the time to write books and give workshops and training courses all around the world. 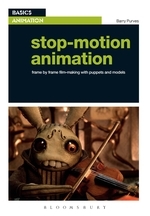 You can’t get hold of a copy just yet – the new edition won’t be available until August – but you will want to … especially when you find out that with it you will also be obtaining the tools to create your very own one-minute animation video, with first-hand instructions from the man himself!